You'll find French, Italian, and many more. Grenoble has a wide range of restaurants to suit all tastes. The Place Grenette, in the center of the old town, hosts several restaurants lined up in a row. You can stroll along and read the menus and see what suits your taste. Check out the daily specials, which can offer a good deal. These restaurants also provide outdoor dining, in season. Canopied covers can provide shelter if it rains. The back streets of the old town offer many smaller restaurants for fine dining, such as the Auberge Napoléon. Just across from the Ancien Palais du Parlement, on the Place St-André, is the Café de la Table Ronde, Grenoble's oldest restaurant, opened in 1739. You can try regional specialties here, such as diot (a local sausage). If you cross the Saint-Laurent footbridge to the right bank, or Saint-Laurent district, you'll find lots of restaurants along the river. Most of them seem to offer Italian cuisine rather than French, so if that's what you're looking for, head across the river. 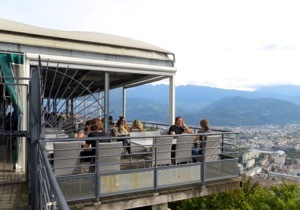 And for a meal with a view, head for Restaurant Le Téléférique, at the Bastille, where you can enjoy not only a meal, but panoramic views of Grenoble and the surrounding mountains. Above, Dining with a view at Restaurant Le Téléférique, atop the Bastille in Grenoble.